A Boulder marijuana company says it has a new breakthrough for medical marijuana patients — a marijuana capsule that looks and acts more like traditional pharmaceuticals. Wana Brands says it now has an alternative to smoking or edible marijuana called Wana Caps. “We feel like we are making an important step in giving patients another alternative in consuming cannabis,” said Wana Brands owner John Whiteman. The marijuana maker worked with Cannabics, a pharmaceutical company based in Israel, to develop the first extended release formula to make marijuana last up to 12 hours. The capsules are filled twice — first with a dose that kicks in almost immediately, and then with a dose that starts to work after about four hours. 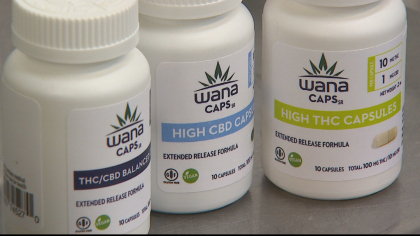 Multiple sclerosis patient Hoot Gibson was one of the first to try Wana Caps and says it was one of the “most helpful things” he can take for his symptoms. “This lets you get the relief you need without hitting such a high level,” said Gibson. He also says the capsules are much more convenient and socially acceptable than smoking. “You don’t have to worry being seen medicating in the ‘old fashioned’ ways,” he said. But, Dr. Kennon Heard at University of Colorado Hospital urges caution about marijuana that claims to be medicine. “The utility isn’t clear. We don’t have the medical knowledge to say that marijuana is useful to treat the vast majority of conditions that people are using it for,” Heard said.